There isn't any other way to describe it. Headhunters is an absolutely stunning Norwegian thriller with two con games colliding in a fury of intellectual friction, fists, and gunfire. Based upon the book of a similar name by Norwegian author Jo Nesbø, the film is an unpredictable joy ride filled with manipulative twists and unforgettable scenes. The first con is perpetuated by headhunter Roger Brown. He works as one of the most powerful executive headhunters in Norway, making 20-35 percent of a multimillion dollar salary any time he matches the right candidate with the right position. It's a high stakes game with big risks and bigger rewards. Being at the top of such a lucrative career would be enough for most people, but Brown has two distinct problems. He's short, standing a mere 5' 6" and feeding what amounts to a cool, aloof, and amoral personality disorder to overcompensate for it. He also doesn't make enough money to keep pace with the extravagant lifestyle he uses to fuel a larger-than-life reputation. Meet Roger Brown. He's a part-time art thief. To compensate for the lifestyle, Brown (Aksel Hennie) has invented a second source of revenue as a part-time art thief. As inventive as the story itself, Brown uses his position to ask candidates whether or not they own any original art, mesmerizing them with analogy that reputation dictates the value of art much like it dictates the worth of a CEO, before a rapid set of questions about family, household staff, and pets. Brown doesn't ask to merely size them up for the job as it seems. He wants to know what he can steal and how difficult the job might be. The only thing he doesn't ask about is their alarm systems. Brown has an inside man at the finest security company, someone who receives a heads up after Brown schedules a candidate's meeting to coincide with any time that no one would be home. This is also what makes Brown such an attractive anti-hero in Headhunters. He doesn't burgle homes, but rather swaps out replica art with the original while his candidate meets with the prospecting firm. Ideally, they won't ever know the original has gone missing, at least not for months. Meet Clas Greve. He's the hardest mark. 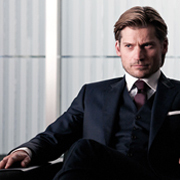 Greve (Nikolaj Coster-Waldau) is everything that Brown believes himself not to be. He is a handsome and charismatic son of an affluent family who recently arrived in Norway and has yet to settle on a job. In fact, Greve is the epitome of everything that Brown believes could steal away his wife, Diana Brown (Synnøve Macody Lund), who introduces the two at the opening of her art gallery. Although immediately jealous of his wife's doting on Greve, Brown sees two opportunities. Greve could be the right fit as CEO of a conglomerate based in Oslo. He also happens to own an original painting by Sir Peter Paul Rubens that was believed to be lost during World War II. The painting could be worth hundreds of millions of dollars, and the answer to the debt Brown has incurred by funding his wife's gallery. What makes Greve an especially hard mark is that any genetic and ancestral blessings he might have are backed up by his first career. He was a special forces operative, specially trained in tracking down terrorists. If there was ever a threat to thwart Brown, it would likely be the one man who is running a con of his own. Headhunters is driven by the near-perfect handling of a sharply dark story. 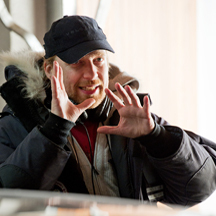 Director Morten Tyldum delivers what most will measure up as his best directorial effort to date. As well earned as the critical acclaim was for his feature film debut Buddy in 2003, everything he had learned in the past decade as a rising film talent has culminated in this film with the help of screenwriters Lars Gudmestad and Ulf Ryberg. Tyldum does an excellent job guiding Aksel Hennie to transform himself from a self-loathing and dislikable character into a protagonist people are persuaded to get behind, despite working on a relatively modest budget and a film schedule shot in the dead of winter. He also added some dark Nordic humor into the film, taking advantage of Norway's willingness to embrace morally flawed characters. He is one to watch, especially now that he is slated for English-speaking films as well. Headhunters Creeps In To Explode At 9.4 On The Liquid Hip Richter Scale. 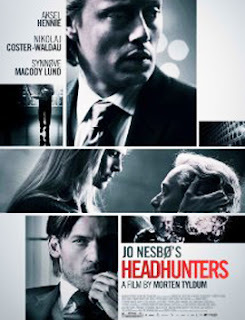 As a twisted thriller that creeps in as an intellectual puzzler and spirals out of control in darkly comic violence, Headhunters tempers itself with convincing performances by Hennie, Coster-Waldau, Lund, Elvind Sander, Julie R. Ølgaard, and others. Likewise, despite being driven as a thriller, it is incredibly unafraid to tap a few tender moments as well. Although released two years ago in Norway before migrating to the United States for a film festival and theatrical run last year, it is perfectly suited to set an early bar among indies and foreign films this year. Headhunters is currently available to rent or purchase from iTunes. You can also purchase Headhunters [Blu-ray] on Amazon or order the film from Barnes & Noble. Subtitles are seldom so fun to read. You can also find the book, Headhunters (Movie Tie-In), on Amazon. For the original novel, with fewer bouts of dark comedy, try Alibris.